Join us for a program geared for children ages 0-5. Click here to sign up for an upcoming program. 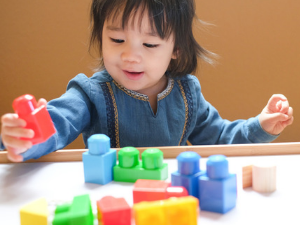 Play and Learn Workshops offer children and their caregivers the opportunity to play and learn with new toys in a safe and stimulating environment. Various community professionals attend each of four workshop sessions to share their expertise about early childhood issues in a relaxed, comfortable setting. It’s a great opportunity to get answers from the experts! Workshops are held in the spring and fall at each Family Place library (Koelbel, Smoky Hill and Sheridan libraries). Registration covers four sessions per location. For children ages 1-3 with a caregiver. 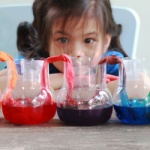 Discover new concepts of science, engineering, math and art with your Little Explorer in this new program series. Children ages 2-5 and their caregivers will investigate a monthly theme that combines learning and literacy. Bring your curiosity and get ready to discover, play and learn! 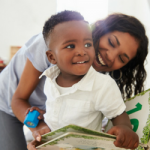 Enjoy storytime, songs and play activities with your little one. Leave with books and fun activities to keep the learning going at home. For ages 0-5 and their caregivers. Gear up for kindergarten in this fun, three-part series. You and your little one are in for an adventure – exploring topics like language, literacy, science and math together. 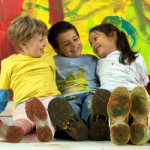 Wear clothes that can get messy; this is a hands-on experience! Borrow a literacy backpack and take home a book to keep. For children ages 3-5 years with their caregiver.